Welcome to the Montana Creek side Guest House, located in beautiful Paradise Valley, just 9 miles south of Livingston, Montana. This newly-finished home sits amongst the pine trees and is adjacent to the sounds of Deep Creek at the base of the Absaroka mountain range. This beautifully furnished new house has all the amenities of a very comfortable home including a spacious fully-equipped kitchen and pantry, granite countertops, full laundry room, two outdoor decks and a gas barbeque. Large open living space with a gas fireplace and lots of natural light. 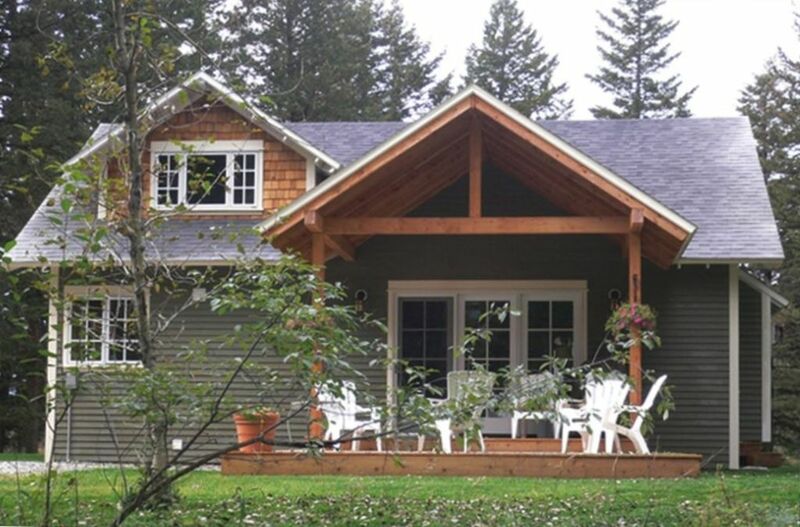 Home sleeps 10 comfortably with 4 large bedrooms plus a loft over looking the creek. Each bedroom has 2 queen beds and its own bathroom. The loft has a single bed and a fold-out couch. Living Room with a wet bar, wireless internet, LCD and satellite TV, and stereo. Surrounded by majestic mountains and the beauty of many rivers, southwest Montana is a Mecca for fishing, hunting, floating, rafting, hiking, horseback riding and plain old relaxing in the great outdoors. The Montana Creek side Guest House is located 45 miles north of Yellowstone National Park. A day's tour of the park is well within range. Fly fishing is a passion for us and we also own and operate an outfitting and guide service called Trout West. Creek side in Deep Creek area of Paradise Valley, treed property, 45 miles north of Yellowstone National Park. Felt like home the second we walked in the door. Above and beyond all expectations! The pictures don't do the home and property justice. It is warm, very spacious and is inviting. The property itself is huge with a beautiful creek running through, incredible views and is accented by a constant view of wildlife daily. This amazing house pales in comparison to the owners who have went out of their way to offer an amazing experience. Many trail heads just a few minutes away and Yellowstone Park less than an hour away. Montana living at it's absolute best. We loved everything about this place! The house and the setting is absolutely amazing! The scenery is so beautiful with the creek that runs behind the house. We loved seeing the deer that like to come and visit. Whether watching tv in the basement, spending quiet time in the loft room or taking a stroll down the lane, this place is a great getaway!! We highly recommend taking advantage of this country home! Recently in the area on business, I found the Montana Creekside Guest House to be excellent in all respects. I highly recommend this property whether traveling for business or pleasure. The photos and listing description are exactly what you get. The part is doesn't describe is the quiet, peaceful atmosphere, the comfortable sitting areas and excellent beds. All the amenities are modern and well maintained. The sitting areas provide for multiple groups (children and adults) to have their own space complete with televisions and recreational area. The kitchen and eating area provides for shared cooking adventures. I have visited this property several years. I have visited for different reasons and with different family members. The host and hostess exceeded my expectations in helping provide the atmosphere and setting I desired for each of these events. They provided wonderful advice and suggestions in organizing the logistics of these family outings. I look forward to the opportunity to spend time with my children and grandchildren in this relaxing, adventurous and fun filled environment. The house is awesome. While it will sleep 10 people very comfortably it sleeps two people PERFECTLY! We've never been so relaxed. You can cook your own food or the owner will provide a very scrumptious menu prepared by her and/or local chefs. The fishing on the Yellowstone is always awesome but especially if you go on a guided trip with the owner. I promise you will never forget your trip. 45 miles from Yellowstone. This newly-finished home sits amongst the pine trees and is adjacent to the sounds of Deep Creek at the base of the Absaroka mountain range.